Our Builder & Architect - bvboys's JimdoPage! There have been so many amazing stories of God's provision throughout the building of the Buena Vista Sports Academy for Boys. Recently, at the Inauguration Event, we shared many of them. At that time, I was unaware of one of the best ones. As we grow close to finishing the construction (only $27,000 away), there was something I wasn't realizing. A few days ago, I was meeting with the builder, Tito, who God beautifully brought our way to be in charge of construction. Noticing that there is no way that we have $27,000 of costs still to go, I asked "so if all we have left is a few doors to install, drainage tubes, and various details, how are we still 27k short?" 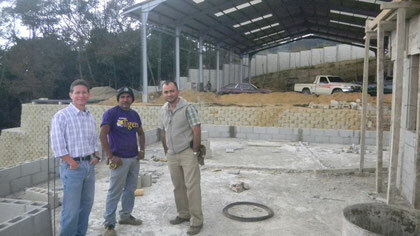 He explained that he and Luis, the architect in charge, have not received any pay to date! He said that every time God has provided, they have been so touched by the amounts of provision (matching the amounts of need at that time), that they decided to defer any of their own compensation until the end. So, these guys have been working for free for the last 10 months. They are out here almost every day (driving from Guatemala City to Buena Vista is no quick trip), pouring their heart and souls into this project, having not received a dime. When Tito told me this, my mind went back to the Inauguration Event. I remembered seeing him and Luis in tears on several occasions as the stories were told and the vision for the ministry was shared. Like so many others, these guys have been an amazing tool that God used to get this project to where we are. We are praying that the remaining funds come in so they can get paid for their work.